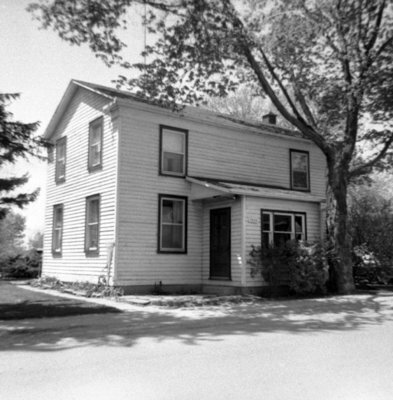 A black and white photograph of 1616 Dufferin Street. View is of the front of the house. This house was located on the west side of Dufferin Street between Victoria and Watson Streets (at 1616 Dufferin Street). It was opposite the Seymour Whitney Residence. 1616 Dufferin Street, May 23, 1969, Brian Winter. Whitby Archives A2013_004_053.